SPRINGFIELD, IL – With warmer days just around the corner, this is the perfect opportunity to take advantage of the Illinois State Fair’s Spring Savings Spectacular! 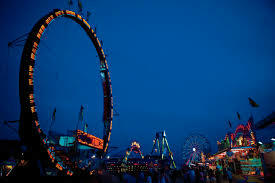 Many fairgoers do not realize now is a great time to take advantage of money and time saving offers such as discount admission booklets and Mega Passes. The Illinois State Fair is an annual end of the summer tradition that provides the ultimate entertainment experience for the young and old with thrills, chills, and shrills. Whether you want to spin, flip, scramble or scream, the Illinois State Fair has the ride for you. The Mega Pass is the ultimate savings featured at the Illinois State Fair. A Mega Pass provides fairgoers with unlimited rides at the Carnival Midway and Adventure Village every day of the fair. (Giant Slide, Sky Glide, and Tram not included). Right now, Mega Passes can be purchased at the Emmerson Building on the state fairgrounds, by phone (217-782-0775), or online at illinoisstatefair.info for the low price of $70. Fairgoers will want to act fast, as this hot deal will not last. The Illinois State Fair Mega Pass is available until July 31st for just $70. Come August 1st, the price will increase to $90 through the end of the fair. Admission Booklets are also available for purchase at the Emmerson Building, by phone (217-782-0775), or online. The booklet contains eleven any-day adult admissions to the 2018 fair, or 10 senior admissions. An adult admission booklet is $60, and a senior admission booklet is $30. Stay up-to-date on all of the 2018 Illinois State Fair announcements by connecting with us on social media. The Illinois State Fair is on Facebook, Twitterand Instagram. We look forward to seeing you at the 2018 Illinois State Fair, August 9-19th in Springfield.